The head of the US forces in the Middle East abruptly resigned last night after a magazine claimed he was at odds with the Bush administration over its hardline policy on Iran. In a move likely to sharpen concern that America may be planning military action against Tehran, Admiral William Fallon, head of central command, quit with immediate effect. Last night he denied he was out of step with the White House, but said the “embarrassment” from the article made it impossible to do his job. 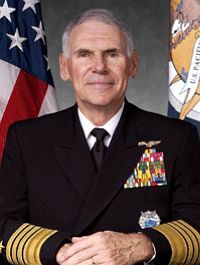 Admiral Fallon was the subject of an article in Esquire magazine that portrayed him as opposed to President George Bush’s Iran policy. It described him as a lone voice against taking military action to stop the Iranian nuclear programme. Admiral Fallon, who is travelling in Iraq, issued a statement through his US headquarters in Florida. There was speculation the admiral had been forced out after clashing repeatedly with his Pentagon bosses over how to deal with Iran. Democrats said the affair showed the gulf between the US government and its own military over Middle East policy. When he was appointed in January last year, the admiral told Senate confirmation hearings that all options for diplomacy must be exhausted before military action could be considered. It was reported to be a veiled criticism of the Pentagon’s willingness to back the Bush administration’s invasion of Iraq in 2003 without giving time for inspectors to assess whether there were the claimed weapons of mass destruction. Last summer, as Washington, backed by London, accused Iran of trying to build nuclear weapons, the admiral went public to denounce the “constant drumbeat of conflict”. Last December the admiral’s caution over Iran appeared to be vindicated when a US intelligence report concluded there was no evidence Iran had a nuclear weapons programme. But the news, and the loss of momentum by America and Britain for new sanctions against Tehran, seemed only to sharpen the knives in the Pentagon. Esquire, which was granted extensive access by the admiral to follow him across the Middle East, concluded that he was “the strongest man standing between the Bush administration and a war with Iran”. It speculated that Fallon, 63, would be sacked this summer because he was thought to be standing in the way of a threat of possible military action. Certainly, his resignation comes as an embarrassment to the White House as it tries to build support for fresh sanctions against Iran. The Bush administration continues to argue that, while there is no evidence that Iran is building nuclear weapons, the only guarantee that such a programme will not begin is a tough inspection regime. And it argues that regime can only be installed under the pressure of sanctions backed by military force. But last night Mr Gates described as “ridiculous” any notion that Admiral Fallon’s departure meant the US was planning to go to war with Iran. And he said there was “a misperception” that Admiral Fallon disagrees with the administration’s approach to Iran. Admiral Fallon began his 41-year career as a fighter pilot and flew missions in Vietnam. He took over a year ago as head of central command, the regional headquarters that oversees military operations in the Middle East, including Iraq. He was installed in the job to counter criticism that the White House had made a political appointment in selecting General David Patreus to command the war in Iraq. The admiral clashed with Patreus over the general’s “troop surge” in Iraq, advocating instead a troop draw-down to allow forces to be concentrated in Afghanistan. In his previous job, as Pacific commander, Fallon had extended contacts between US officers and their opposite numbers in China, calling for a greater understanding between the two powers. And he repeated his “softly softly” stance in his new position, convening for the first time a summit of Gulf-region defence chiefs at his HQ in Tampa, Florida. He will retire early at the end of the month and his deputy, army Lt Gen Martin Dempsey, will take charge of central command until a long-term successor is chosen. Last night, President George Bush said Fallon deserved “considerable credit for progress that has been made in Iraq and Afghanistan”.